Wandefloor Inwase was exclusively developed for indoor areas and provides a stable and highly resistance ceramic surface. Panels are a set of porcelain tiles plus a special reinforcement applied on its backside that, increasing it only 2-3mm, provides this set of a very high resistance. This reinforcement is composed of a polymer base called STRONGCID, with a fibber glass mesh inserted therein. Panels are supported on stringers that form a steel framework providing stiffness to the system. These 30x30mm section stringers are continuous in one direction and cut in the perpendicular one. At the same time, several steel pedestals that rest on the existing floor support these stringers. Joints are set once the panels are installed. 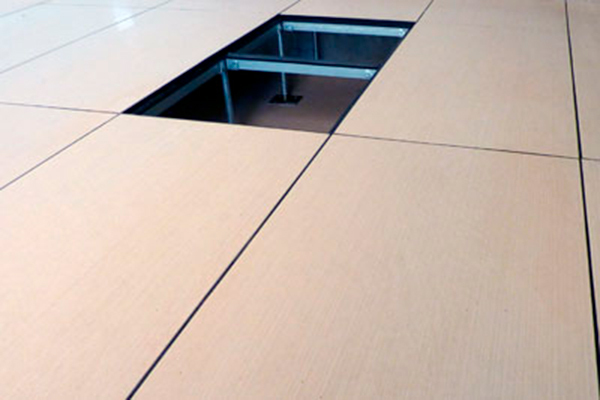 This is a specific, longitudinal and continuous joint is engaged in a PVC longitudinal groove, delimiting the perimeter of the floor panel and avoiding a direct contact with the steel. The main difference with other raised floors systems is that the porcelain tile reinforcement is up to 15 times thinner, such as its weight, providing an important transport saving and a lower height if necessary. Porcelain tile rectified as a upper surface. Strongcid Solution, to provide the necessary loading and impact resistance. Specific treatment for the necessary thermal and acoustic absorption, and high fire resistance. Longitudinal steel stringers as a edge tiles reinforcement. PVC T-shaped to make easier the panels installation. PVC strip among tiles to guarantee the sealing. Steel W-PLOIN pedestals to adjust to the required height and allow the installation of wirings or pipes.